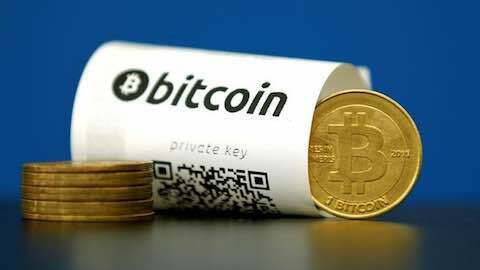 Wild swings and a lack of liquidity is keeping U.S.-based mutual fund managers from investing in bitcoin even as the digital currency hits record highs. Only four out of the more than 10,000 mutual funds based in the United States have bitcoin as part of their portfolios, according to data from Morningstar Inc. Of those four, three are from the same New York-based firm, Kinetics, which collectively manages $1.2 billion in total assets. The company declined a request to comment for this story. The value of bitcoin has more than doubled this year in volatile trading as retail investors in Japan and South Korea have piled into the digital currency. Bitcoin has also been increasingly used in so-called ransomware attacks because of its untraceable nature. More funds would likely invest in bitcoin if the Securities and Exchange Commission were to approve an exchange-traded fund that holds the digital currency, said Todd Rosenbluth, director of ETF and mutual fund research at CRFA. Such a move would allow fund managers to easily buy and sell shares of bitcoin to either speculate on its price or to use as a hedge, similar to how funds invest in the $34.3 billion SPDR Gold Trust ETF in order to get exposure to gold, he said. "From a mutual fund perspective, liquidity is paramount," he said. Investors Cameron and Tyler Winklevoss tried for more than three years to convince the SEC to allow the first bitcoin-focused ETF. The agency's staff ruled against them in March, yet the commission is now reviewing that decision. Any U.S.-based mutual funds that do have exposure to bitcoin own it through shares of the Bitcoin Investment Trust, a $797 million closed-end fund sponsored by New York-based Grayscale Investments that trades in the lightly-regulated over the counter market. Each share of the fund owns approximately a tenth of a bitcoin. The lack of availability of the shares have pushed their prices well above the underlying price of bitcoin itself. Shares of the closed-end fund were up 77.1 percent recently, according to Thomson Reuters data, while bitcoin itself was down 2.9 percent. Those wild swings and lack of clear prices make bitcoin "uninvestable" right now, said one mutual fund manager who did not want to be quoted by name. Investing: "What's Keeping Funds Out of Bitcoin"